The idea is to take out a kind of insurance policy to cover the bulk of the debt and fund what's left from county reserves. County Debt Manager Karen McFarland says the deal costs about $300,000 up front. “It’s a one-year solution. There’s potential for renewal but don’t know and we won’t know until we get there,” she says. 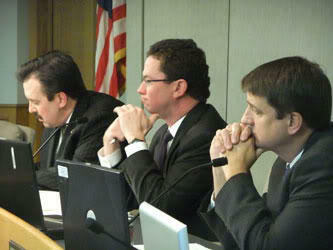 The deal would preserve the property tax rebate for residents the county reinstated this year. County Administrator Christian Sigman - who isn’t making a recommendation for or against the proposal - says the insurance company, BBVA Compass, wants some assurances. Meanwhile, the Children's Services wing of Hamilton County Job and Family Services says it's seeing success after making changes thanks to an emergency cash infusion from Commissioners. The board approved $2 million back in April. The money was used to hire additional caseworkers, contract with a transportation service to help kids get to doctor’s appointments or meetings, and improve computer-related tasks and paperwork. The agency says it has hired 27 people in the last six weeks. More staff were needed to deal with the increasing number and complexity of cases.